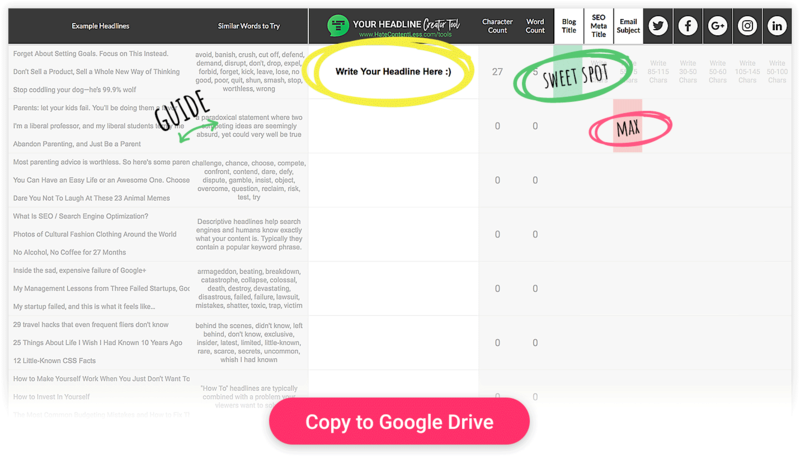 Updated 11/21/2017: Get more comments, likes, shares, backlinks, and traffic for your content with these three, free tools: (1) Social Media Cheat Sheet, (2) Title/Headline Creator, and (3) Blog Post Template. You spent days fine tuning your blog post. It’s amazing, right? And you want thousands of people to ooh and ahh over it. But you’ve been blogging for years and still feel like something is letting you down when it comes to bringing more traffic to your website. “Hmmm,” you have a hunch: “Maybe it’s the titles that headline my blog and social media updates”. There is an 80% chance you are right (more on that later). I’ve made this mistake. It’s a website traffic killer. Don’t let someone’s stinky ‘farticle’ beat you. A fake article with a good headline will outperform a good article with a bad headline. I’m sure you get it. You Google something, whip through your social feeds, and click on the headlines that stop you dead in your tracks. You probably don’t even read the full article. Be honest. I do it too. Time is short. So we click, scan, glean insights from images and subheadings — maybe read bits and pass it on to friends. 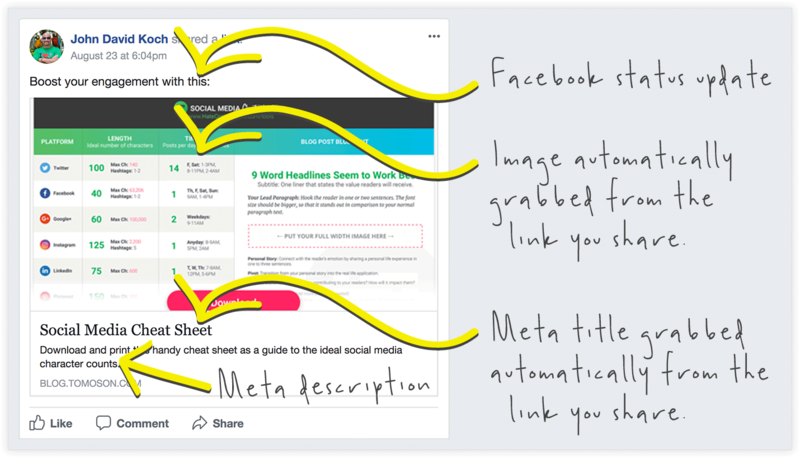 Sharing links is our way of giving value to the friends we don’t always see in a couple clicks. It also helps people get to know us and the things we care about. But people aren’t going stumble into your content unless it has a good headline. Great headlines in search engines, social feeds and blog posts get shared. Here are three specific things you can do — before you hit publish — to get 10 times more people engaging with your content. Get notified when I update this cheat sheet (v1.1) and create new tools. You can stop writing wordy headlines and stop filling your social updates to the max. Start writing the optimal amount of characters for Tweets, Facebook updates, Instagram captions, blog headlines and more. Your post will get more comments, likes, and shares that way. Download and print this handy cheat sheet for a guide to the ideal social media character counts. 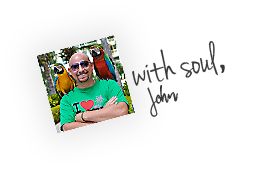 It will help you dial in your lengths for social media headlines and blog titles. Pay special attention to the first and last three words of your headlines and updates. People miss the middle part, mentions Kissmetrics. Make the beginning and end extra juicy. The cheat sheet also shows you the peak times for posting and how many times you should post per day for each social network. 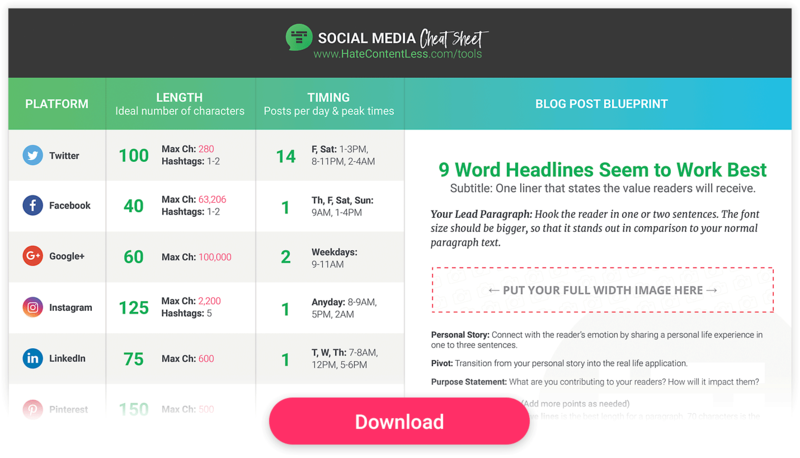 Here is how I came up with the cheat sheet’s best characters counts for social media posts and the blog post template. The data is a bit boring (yawn), but is provided below for you to reference. Google+: 60 characters are ideal for Google+ if you want your entire headline to display, mentions Copyblogger. You could include the max of 100,000 characters. That’s about a 100-page book packed into one post. Instagram: Less than 125 characters is better on Instagram captions. Four to five hashtags get the best engagement, according to a TrackMaven Study. The max is 30 tags and 2,200 characters. LinkedIn: Anywhere from 50 to 100 (75 on average) characters for a LinkedIn status update works best. 600 would be the max, reports Sprout Social. Pinterest: 100 to 200 character (150 on average) pin descriptions get you the most repins, claims Social Marketing Writing. You’ll limit out at 500 characters. Twitter: 100 characters appears to be the perfect length for a tweet, states Track Social. This gives retweeters room to add their own characters. You all probably know that the new character limit is 280 for Twitter. Email Subject: 65 characters is ideal for email subject lines. If you provide too many, say greater than 100, your email subject will perform the worst, according to 2 million emails analyzed by Return Path. Sweet Spot: If you’re in a time crunch, you “could” use 80 characters to update across all platforms. When I computed the average ideal character counts for popular platforms (Email Subjects, Facebook, Google+, Instagram, LinkedIn, Pinterest, Twitter, Headlines and SEO Meta titles), I found 80 characters to be the sweet spot. I did not include Snapchat (Max of 80 characters) and YouTube (Max of 100 characters) in my data. The max characters lengths are known however, there is not enough data to come up with an ideal character count for each. Post Frequency and Timing: The social media cheat sheet also provides tips on when to post to social media (peak times) and how often to post. These times were gathered from CoSchedule and the 14 other studies they used to research the best times to post. 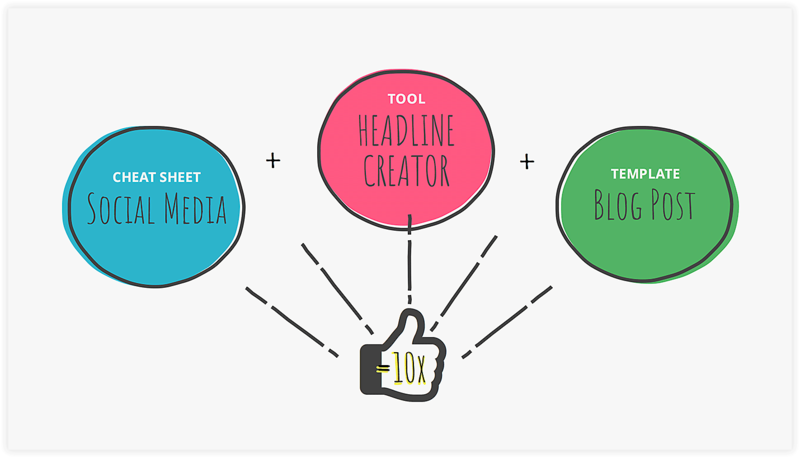 Get notified when I update this Headline Creator (v1.1) and create new tools. Crazy people say you should spend 80 percent of your time writing your headline. Doesn’t that sound insane? People get a little nuts when labeling things with the 80/20 rule. I mean — that’s 12.5 hours perfecting your headline if it takes you 2.5 hours to write a blog post. But maybe they aren’t as crazy as you think. Did you know only 2 out of 10 people who view your blog actually read it? However, 80% will read your headline. Yet, they still share your post… if your headline is good. Make your headline so magical they want to share it. Just don’t spend 12.5 hours on it! That’s why I created the free Headline Creator tool that will help you knock out 20 headlines in minutes. After you are done, pass them around to your inner circle and keep the best one. Re-purpose a couple of your other top headlines for your social media updates. 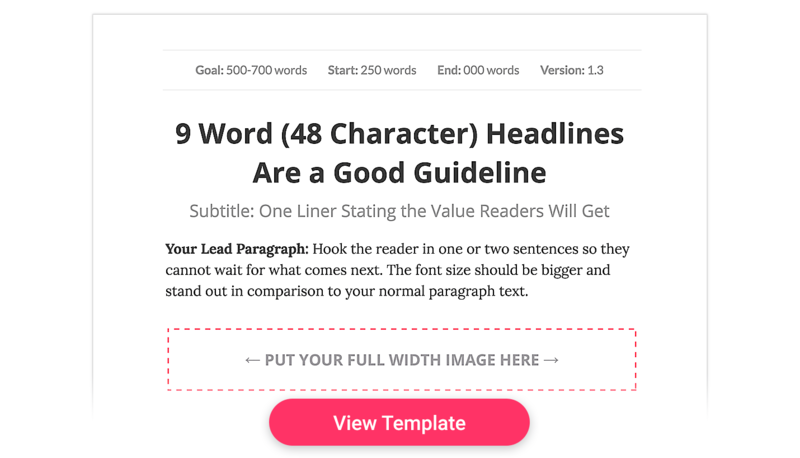 The Title / Headline creator tool includes 60 real-life headline examples broken down into 20 headline categories. These are real-life headline examples that actually got shared and had good engagement. Use them as a reference, mixed with the “Similar Words to Try” feature to knock out your headlines fast. As you type, the character and word counter will let you know how you are doing for length. Get notified when I update this blog template (v1.3) and create new tools. Multi-Million dollar blogger’s like Michael Hyatt use blog post templates to maximize their time and impact. Inspired by Michael’s teaching, I decided to put together a blog post template of my own. I started with a blog post outline very similar to Michael’s. Then I researched each element and inserted explainer text into the blog post template to serve as a guide. You can grab your copy of the version in the printable blog post cheat sheet, or snag the Google doc blog post template I made for you. Writing makes me a little nauseous, so I wanted to make things easier. I hope this helps you hate writing less. It did me. I’ll take using a guided blog post template over staring at a blank white screen any day. The blog post template limits writer’s block and frees creativity when you’re feeling uninspired. It also stops second guessing and regressing. What’s the best headline length? Subtitle length? Are my paragraphs too chunky? The template keeps your writing flowing forward. Lead Paragraph: Hook the reader in one or two sentences so they cannot wait for what comes next. The font size should be bigger and stand out in comparison to your normal paragraph text. Rationale: Add subheadings for each main point and explain the rationale behind each. Note: Up to five lines is the best length for a paragraph. 70 characters are the best length for a sentence. This means your max content width would be about 560 pixels wide on large screens. Although research backs this, it’s rare for blogs to put this width into practice. Content that is around 700 pixels wide is more common and helps readability. Beef up your blog post with relevant images every 350 words if you want to be a top ranking blog, according to one study. Avoid stock photos of people, says Nielson Group. They’ll be ignored. Photos of authentic people are appreciated and get 10% more viewing time than text. If you follow the principles above you’ll also have a week’s worth of visual content to share through social media. Do you have any tricks or tools that have worked well for you? You can leave a comment by clicking here.